Kneel Before Blog - Arrow - "The Return"
The title of this episode of Arrow works on so many levels this week. We have Oliver returning to Lian Yu which gives us the return of Slade Wilson as well as the flashbacks chronicling Oliver’s return to Starling City for 24 hours. I did appreciate that the episode flipped the standard formula and gave the flashbacks more screen time over the present day action. It was a welcome reversal and made things feel very fresh. I don’t think this was the best episode to do that as the return of Slade Wilson deserved to be more prominently featured than it was. He is the most engaging villain this show has had so to relegate him to such a minor role was disappointing. One thing that really confused me about this was the lack of Captain Boomerang. Wasn’t he supposed to be sharing a cell with Slade so where was he in this episode? It would have been really cool to see Oliver and Thea hunted by these two characters. Surprising nobody is that Malcolm Merlyn wasn’t entirely truthful when sending Oliver and Thea to Lian Yu to train. Malcolm gives the justification that Oliver needs to reawaken his killer instinct to stand a chance against Ra’s Al Ghul. The only way to do that according to Malcolm is to let Slade out and force the siblings to fight him to the apparent death. Something tells me that it’ll turn out that everyone is a pawn in Malcolm’s endgame whatever that is. Malcolm doing this made a lot of sense as he is very duplicitous and uncompromising in the way that he makes people train. It does seem that any signs of humanity within him were little more than an act to get Oliver and Thea on side to do what he wants. I wonder if he’s looking to take over the League of Assassins, it certainly wouldn’t surprise me. Oliver and Thea on the island did give us some really interesting moments. Thea found out that she was used as the instrument that killed Sara and that knowledge is starting to eat her up inside. She has been made into a killer against her will and that’s something she can’t forgive Malcolm for doing this to her. Last week her turning on him felt a little convenient but this week it feels well earned with ample justification for Thea’s hostile feelings. This episode highlights how much stronger Thea has become this season. The way that she bravely accepts needing to have her shoulder dislocated to reach the mechanism that opens the cell doors and the way she conducts herself during the fight with Slade are proof of that. I liked Slade’s comment about Thea’s eyes betraying exposure to darkness. She has been corrupted and will never be the same again. Oliver’s conflicted nature was interesting here as well. When he went to see Slade in prison because he felt that he had to was a great moment for him and the hesitation before opening the hatch was a nice touch and the fact that he doesn’t see any other place to turn than Slade Wilson shows just how isolated Oliver feels at this point in time. Slade’s final conversation with Oliver is great. There’s still the sense of hatred that currently defines their relationship and the subtext is certainly adversarial but Slade talks to Oliver in a way that makes them feel like old friends albeit from a friendship that has ended. 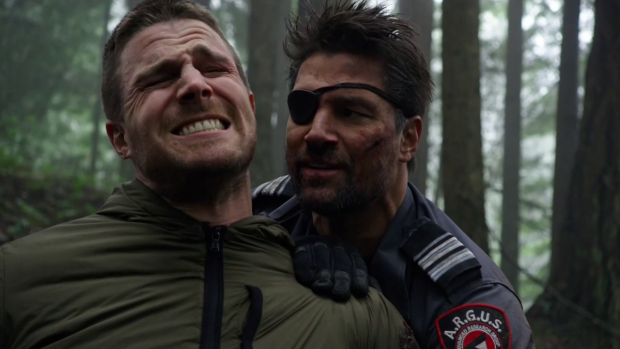 Slade is attacking Oliver on a mental level and making him consider what he has lost. Slade dealt a crucial blow to Oliver with this conversation and that was just great. I have a complicated relationship with the flashbacks in this episode. On one hand there were some really good scenes in there and I’ll get onto those in a bit but on the other it really didn’t work on many levels. Oliver returning to Starling City for 24 hours during his exile is such a ridiculous concept that I can’t believe that it ever got out of the planning stage. Oliver and Maseo could have went anywhere for the thing they were looking to retrieve and many of the same things could have been accomplished with flashbacks not featuring Oliver. 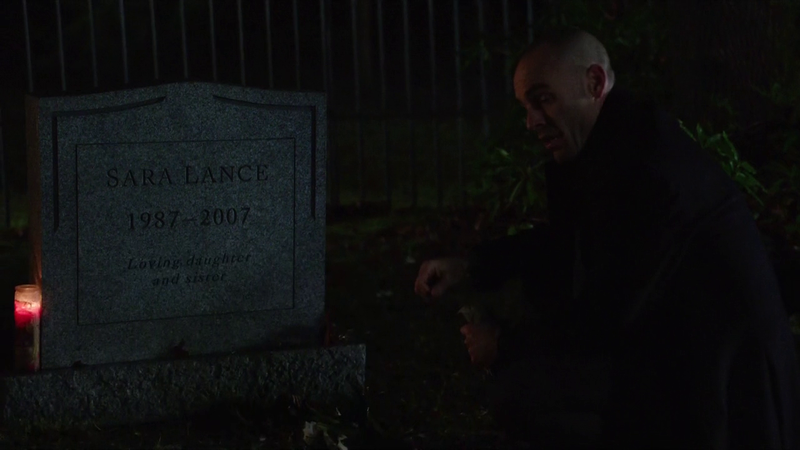 The first person he sees is Thea who visits the graves of Oliver and his father while managing to buy drugs. It was interesting to see Thea characterised as the obstinate teen that we met at the start of season 1 to contrast with how she is now. It’s a significant change and the reminder of how she used to be goes a long way towards reminding us of that. Did Oliver need to be skulking around in the background to show us that? Absolutely not! Oliver also manages to see Felicity when he is sneaking around at Queen Consolidated. She comments that a picture of him looks cute and it’s a shame that he’s dead. The level of foreshadowing in this scene is insane, made even worse by the fact that we sort of know how this turns out. Oliver being present to watch her from across the room and the knowing smile he gives completely undermines the innocence of their first meeting 5 years later. I always got the impression that the first time he saw her was when he first went to see her. We don’t need this kind of thing complicating the plot any further. Ultimately it was pointless as we don’t learn anything new about Oliver or Felicity here and it doesn’t give us any meaningful insight into their relationship. We have a similarly tacked in appearance by Diggle who speaks to his brother about how dissatisfied he is with looking after spoiled billionaires. The scene really added nothing other than giving us some Diggle facetime which I suppose is worth it in itself. The flashbacks did give us the opportunity to see Tommy again which was really welcomed. Seeing him stick up for Thea in a brotherly way is nicely done as it shows his willingness to step into the role when Oliver was presumed dead as well as having the added subtext of them actually being siblings and not knowing it. Again, Oliver wasn’t needed to bear witness to this. It has been pretty much stated that Oliver didn’t see anyone he knows in the 5 years he was gone so why is this being changed? Him seeing Thea buy drugs makes no sense as he had no idea she was the sort of person who would take drugs when he returned in season 1. For a while he still saw her as his baby sister and was ignorant to the fact that she had changed so much when he had been away. We also get a double origin for Laurel in this episode. Firstly we find out the reasons she decided to be all altruistic and work for CNRI instead of a big faceless and rich Law Firm. Turns out that her father got to her with an impassioned speech about helping others. I thought that Laurel was always self righteous so didn’t need to see the origin of that either. Also, did we really need to see the start of her and Tommy’s relationship? I’d say not. Also, why was Laurel depicted as blonde in the flashbacks? Wasn’t she a brunette in season 1 (including the flashbacks). Willa Holland was made to wear a wig here so why not Katie Cassidy? The best thing about these flashbacks was Quentin Lance. Seeing him torn up over the loss of his daughter and the end of his marriage was great. Paul Blackthorne does a great job of portraying Quentin as a man so consumed by anger that he has drunk himself to the point where he can barely stand. His pain comes across perfectly and it ties wonderfully to the modern day where he is going through the same thing but this time he is consumed by despair rather than anger. It’s also great to see him remain strong by not turning to alcohol again but still seeming vulnerable and struggling to get through the day. I am interested to see how Laurel and Quentin’s relationship will fracture. Also, he figures out that Laurel is Black Canary so easily but still doesn’t see that Oliver is The Arrow. I wonder if he’ll also blame The Arrow for his daughter’s death and bring and end to that alliance. Despite the pointlessness of the flashbacks I actually really liked them. It was fun to revisit the characters before the show began and I did like seeing the birth of Oliver’s vigilante tendencies even if they were a little too obvious. The mention of grease paint and him wearing a green hoody were a bit too clumsy for me. It was good to see the return of his father but it seems like Oliver needed to be beaten over the head with a sense of responsibility before taking . up his mission. I thought the origin was fine as is and didn’t need this level of expansion. Having said that his decision to kill Thea’s dealer coming so easily to him is a great contrast to the present day where he does his very best not to kill. As good a contrast as it is we still don’t get any better insight into the character. A really uneven episode that does some things really well but leaves me scratching my head over some of the decisions made here. Oliver and Thea being on Lian Yu was nicely executed and it’s interesting to see Malcolm Merlyn on the double cross again. 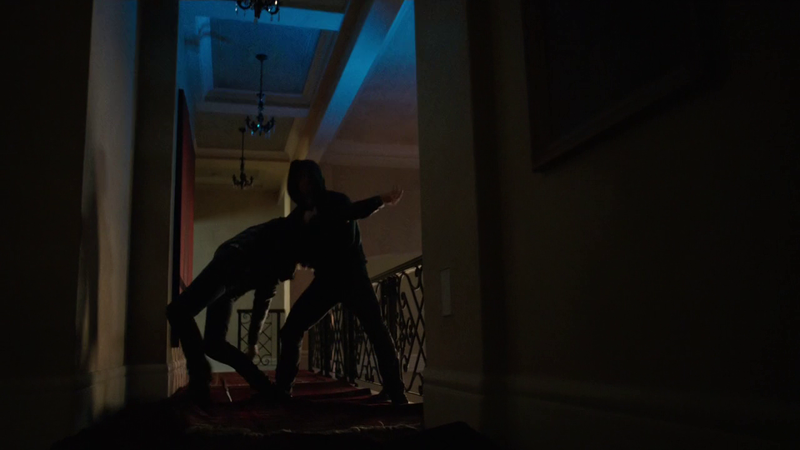 He seems desperate to turn Oliver and Thea into killers for reasons that remain unclear for now. I continue to be interested in Malcolm’s endgame and where Oliver and Thea fit into this. Thea finding out that she killed Sara is handled really well and provides the perfect justification for her hatred of Malcolm Merlyn. How she will continue to live with herself should make the show interesting over the next few episodes. Slade Wilson is as great as ever. He is physically and mentally intimidating and provides Oliver with a great challenge. Their final conversation where Slade talks to him more as an old friend with the added antagonistic subtext to their relationship was superb. Slade managed to deal Oliver a significant mental blow that will follow him back to Starling City. The flashbacks were confusing to me as I did really enjoy seeing the characters at a stage in their life before the show began but in most cases it was entirely unnecessary. Oliver being there was certainly something that wasn’t needed and him seeing Felicity as well as Tommy’s brotherly connection with Thea didn’t work at all. A major issue with it is that these scenes undermine what we already know about the characters. It’s pretty much a given that Oliver didn’t know who Felicity was until he went to her for her help with an Arrow related issue he couldn’t solve himself. It’s also clear that he hadn’t seen Tommy in 5 years when he comes back. Quentin’s role in the flashbacks was the most significant. We see him drunk and angry as he grieves for Sara which provides a nice mirror to the present day where he is grieving differently. Anger has been replaced by despair and he has no outlet now that he no longer drinks. Seeing the two stages in his life was really effective in showing how far he has come. For the most part I enjoyed the flashbacks as a fan of the show but I’m not sure why we need further signs that Oliver was inspired by his father to feel a sense of responsibility and right his wrongs. I definitely know we don’t need to see the start of Tommy and Laurel’s fling as well as an origin story for her working at CNRI. It was all pointless and added nothing to the characters. I gave the episode a higher rating for pure enjoyment of these scenes despite their clumsiness.